The Macallan – Limited Edition 2018 – Classic Cut 51,2% ABV! Dear friends, followers, and supporters alike! 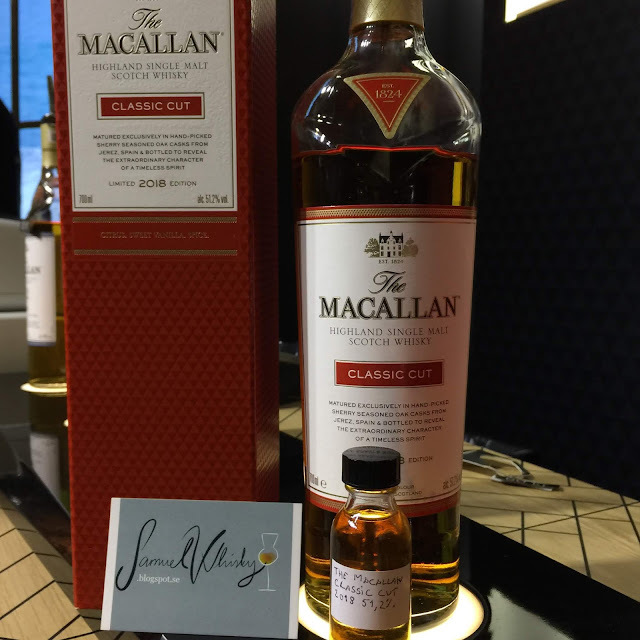 When working the Stockholm Beer and Whisky festival last year (for Edrington Sweden) we had the 2018 edition of The Macallan Classic Cut with us, and so I was generously allowed to draw a small sample of it for reviewing! We are just "a little" behind here in Sweden with the release, and I've held on to the sample for five months, but now, finally, this whisky is released at the state monopoly on thursday the 4th of april! Please click here to have a look at the product. The (vatting) strength this time around is 51,2% and the casks used are "sherry seasoned oak casks from Jerez, Spain" as the label below says. Well ok folks, let's do some analyzing! Nosing gently a couple of centimetres from the glass the first thing that whiffs by is warm apple jucie (must; or rather warm apple cider), this is however not predominant. Nosing closer and properly I find that the centre of the nose holds vanilla fudge, classic oloroso sherry (dried figs), honey sweetness (yes, very much of sluggish/viscid light honey), and at the same time something a tad salty. Surrounding this layer is a touch of something citric together with the strength/ABV that comes through in a bit of a rough way… If I remeber the 2017 CC correctly, this version is not as ”deep” and ”heavy” on the (european oak) oloroso as the previous, so probably predominantly american oak oloroso in the recipe of this version. Oh yes, definitely predominatly american oak sherry in this version; burnt citrus, heavy on the vanilla, lightly roasted almonds, a tad salty. Then comes the actual sherry flavours with dried figs and light and dark raisins. This is taken over rather quickly by an ”oaky-ness”, and most of all a medium to heavy dryness. In the early aftertaste the vanilla comes back once more with just a tad of leather and a whiff of melted butter. At the end of the aftertaste, the strength/ABV shows itself and the flavour ends with dryness. Finally, a big thanks to the nice people at Edrington Sweden for allowing me to draw a sample of this one and for the great opportunity to review the whisky before its swedish release! For kind of weekly updates please make sure to follow my FB-page by clicking here, my instagram by clicking here, and my twitter-page by clicking here. Copyright © and All Rights Reserved on all tasting notes and text by SamuelWhisky and pictures and videos likewise belong to SamuelWhisky, unless stated. If you would like to use any such material that belongs to SamuelWhisky or associated with SamuelWhisky, please ask by sending me an email to samuelkarlssonorebro [at] gmail [dot] com and by stating the source. Swedish Whisky from Hven Distillery – Alkaid 45% ABV! Dear friends, followers and supporters alike! On the 27th of February, the swedish distillery Hven held a press-tasting for their latest release. It was a great feeling to once again receive an invitation to attend the event, but most unfortunately I was not able to attend... However, to my great joy a very generous and beautiful mini-bottle containing 10cl arrived in my postal box in the beginning of the week, and so today I'm very glad to be able to share with you my review of it! "Out of the nine casks who are part of the mix, the recipe is 12,35% lagermalt, 9,5% chocolate malt/ale malt, and 78,1% peated malt. The casks used are: one cask of Petrea oak from Allier which previously held chateau margaux, one cask of Faginea oak from Portugal that previously matured Oloroso sherry, five casks of Muehlenbergii oak from Missouri that was previously used for maturing Hven vodka, and two casks of Robur oak from Bougogne that has been used for maturing wine from Maculan" (my translation). The whisky will be launched tomorrow at the swedish state monopoly and you can view the product by clicking here. Ok folks, let's see what we have here! Wow! The first thing on the taste is salty-ness, and judging from the nose I really did not see that coming! The salty-ness is mellow but at the same time evident. Then we have a slight whiff of brownsugar sweetness and dark vanilla that developes into a beautiful malty-ness, in turn slowly moving on into bread/loaf sweetened with baking syrup, in turn moving on into crackers (something like the Digestive brand), and then, in comes the peaty-ness! A very malt-y and almond past-y peatyness in fact, with evident milk chocolate shining through, yummie! This part of the taste also has something ”roasted” going on… it has a slight bitterness to it and the ABV makes my chest warm. The first phaze of the aftertaste gives sundried grass, leaves of green tea, and leather which rises to the roof of my mouth. The second phaze has some traces of sugar sweetness and at the same time makes my mouth go medium-dry. At the very end of the aftertaste the malty-ness and grassy-ness lingers on. Firstly, I do feel that the nose mediates mature whisky more than the taste does. So even though I’ve written more notes on the taste than on the nose, don’t let this fool you; the nose is (somehow) more ”complex” and ”unique” than the taste, and when the peaty-ness and the salty-ness has passed away on the taste it is mostly about the malty-ness and the medium-dryness. Still, that part my friends is a beautiful one for sure! It has been very interesting, and I feel privileged to have had the honor, to follow and review the different releases in this series, and I really look forward to discover what’s next for Hven! Finally, big thanks to Camilla at Hven for sending me this sample and for the great opportunity to review the whisky before its release! For kind of weekly updates please make sure to follow my FB-page by clicking here, my instagram by clicking here, and my twitter-page by clicking here. Copyright © and All Rights Reserved on all tasting notes and text by SamuelWhisky and pictures and videos likewise belong to SamuelWhisky, unless stated. If you would like to use any such material that belongs to SamuelWhisky or associated with SamuelWhisky, please ask by sending me an email to samuelkarlssonorebro [at] gmail [dot] com and by stating the source.